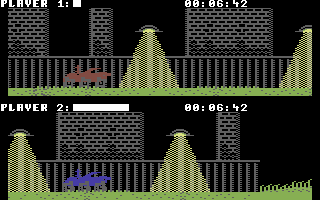 The object of the game is to put up a good race with two or four players. 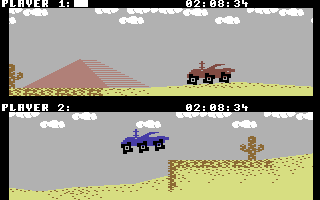 The Decathlon style gameplay takes place in splitscreen, but this time the players are Moon Patrol buggies rather than human runners! 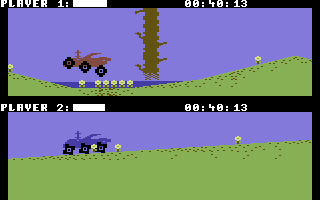 Waggling the joystick makes the buggy accelerate and the faster the movement the faster the vehicle goes. But it's not just joystick-shaking; there are also big ski-jumps, abysses and walls for the player to negotiate with skillful jumping and in places there are ground hazards like mud that can slow you down and spikes lurking that can puncture your tires, leading to disqualification. Your skill at avoiding these hazards is what can win or lose a race and your efforts will get rewarded by an entry into one of 32 saveable race time records. C64 or C128 in C64 mode, 1541/1571 Floppy, 2 or 4 Joysticks. 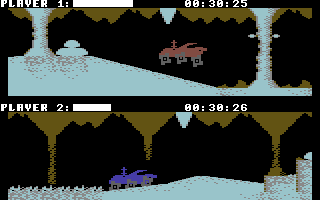 In the 2 versus 2 player game you will need the 4 Player Interface. This game is PAL and partially NTSC compatible. On NTSC machines, glitches might appear in the scrolling! Responding on the players feedback, we improved the steering a little. Just download the disc image, load the TP-PATCH 1.2 and follow the instructions. 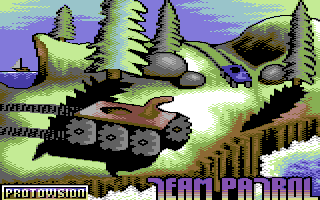 There is also a demo of Team Patrol on this disc, based on the new 1.2 patch! The game features eight courses in different graphic styles; you will race through bushy forests, hot deserts and technical buildings. The data amount is approximately of 200 blocks (heavily crunched!). For playing you will need a C64 with preferably 2 to 4 joysticks (joypads are not particularly suitable to this game). And if you own a CMD SuperCPU, it can be used as a RAMDisc for the game data.